We can only speculate what the future holds for uniforms in the CIAA, SIAC and SWAC, we know we what these old threads back. Two weeks ago news broke that HBCU football’s affiliation with Russell as a uniform provider would be ending as the company announced it will no longer produce team uniforms. Before we figure out what teams in the CIAA, SIAC and SWAC will be wearing down the line, let’s look back at some classic throwbacks we wouldn’t mind seeing revived. 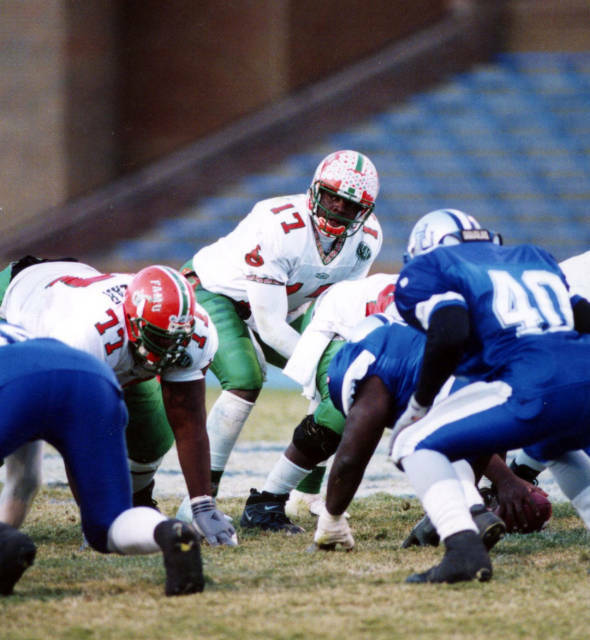 Whether it was the orange jersey and pants with green lettering, the green jersey and the orange pants or the white jersey with the green pants and orange letters, the late 90s was an iconic time for FAMU football in terms of success as well as style. It wasn’t just the simple style and smooth material, but even down to the little details like the embroidery around the neck. It didn’t hurt that some of the great players in recent FAMU history like Pat Bonner, Quinn Gray and Jacquay Nunnally rocked these. James Roe was an All-American receiver for Norfolk State in the 1990s. Photo by the Daily Advance. Think Notre Dame’s Kelly Green and gold with Green Bay Packers pants. During its time in the CIAA the green and gold was nothing to play with, and with its simple but bold design players like Aaron Sparrow and James Roe established themselves as all-time greats before NSU moved on to the MEAC following the 1996 season. This Orange Crush look is a stellar one for several reasons. Gotta love the Big V that quarterback Gregory Clark and his teammates wore on their arm in the mid-1990s. The funky “Trojans” script on the helmet was a good look as well. VSU actually rocked orange jerseys against Winston-Salem State earlier this year, but the V over the arm would be a nice touch going forward. Not only did Starter make some of the best jackets around, they also made some pretty good jerseys. Pretty sure Starter doesn’t make uniforms any more, but these Navy babies were pretty sweet. Add in the gold helmets with the SU in blue and white and you have the uniform that Michael Hayes and Co. used to power SU to the first-ever SWAC Championship Game win. The 1990s witnessed a renaissance in North Carolina A&T football, as Bill Hayes transformed a middle of the road MEAC school into a conference power. A big part of that iconic era was A&T’s gold helmets, which were a perfect contrast with its blue uniforms and yellow numbering and fit perfectly with its gold jerseys and blue font. If only we could have gotten to see Tarik Cohen flying by defenders in this beauty. Mississippi Valley in happier, simpler times and uniforms. With a complex color scheme like Mississippi Valley State’s green, red and white, simple is usually the best policy. And these mid-1980s fits are about as clean of a look as you can hope for, and kinda resemble some classic Miami uniforms minus the orange. And it doesn’t hurt that one of the greatest passing duos of all-time, Willie Totten and Jerry “World” Rice ran Archie Cooley’s offense to perfection, putting up numbers that still are impressive more than 30 years after they connected for their last touchdown pass. That’s a classic picture of the Aggie offense from 1997.